The trucking industry is a vital part of the American economy, supporting large and small businesses around the nation. Trucks pick up and deliver billions of tons of goods every year, bringing them to their final destinations and enabling businesses to survive. Owning a trucking company is a respectable and rewarding career, but it requires a bit of specialized knowledge and preparation. If you want to enter this market and start your own trucking company, follow these steps for success. There is a strict rhyme and reason to how the trucking industry operates. To start a trucking company, you must understand and obey the many rules and regulations involved. The Federal Motor Carrier Safety Administration (FMCSA) regulates almost all aspects of the trucking industry in America. The first step to starting a company is identifying which goods your business will transport and where they will go. Certain items have different requirements, such as loading and unloading processes. If you’ll be transporting goods across state lines, you need to grasp interstate transport laws. Nail down the details of your transporting services and learn as much as you can about the rules that apply. A good place to start is the FMCSA website. There are two basic types of trucking company owners – owner-operators and owners who subcontract their drivers. Owner-operators own their trucks and drive them. They run a privately owned business and have more freedom in how it operates. As an owner-operator, you typically need more working capital and have to meet certain small business requirements. Your other option is to hire subcontracted drivers. This may be the right choice for you if you prefer to let others do the driving while you handle the business end of things. Subcontracting drivers requires employing outside hires to transport goods. You would hire drivers on a contract basis for specific jobs. Both business models have pros and cons. Hiring drivers may cut into your profits, but it may also make your company more scalable. Driving your own trucks puts you in control of your vehicles, but you may not want the responsibility. It’s up to you to decide which method is ideal. Once you make this choice, you can create your business plan. A business plan for a trucking company needs to address expenses, the number of trucks you want to own (or lease), and the returns you expect from your business. Factor in truck maintenance expenses and the cost of hiring drivers, if applicable. Your plan also needs to include typical small business aspects such as marketing and advertising. Think about your projected cash flow, and come up with a plan for cash flow shortages. This may be applying for a small business bank loan or covering gaps with invoice factoring. Planning can give you peace of mind and an actionable way to tackle roadblocks. With a solid business plan in your back pocket, you’re ready to begin. As a highly regulated industry, there is a bit of red tape you’ll have to go through before you can become the owner of a trucking company. You need to acquire a commercial driver’s license if you’ll be driving your trucks. If you want a limited liability company (LLC), file the paperwork necessary with your state. Purchase or lease a truck or fleet of trucks, and buy an insurance policy for your business. Meet your state requirements for truck registration, permitting, tax filling, and business/car insurance. Starting any business takes a lot of paperwork, but the trucking industry has more stringent requirements than most. Finally, you’re ready to begin obtaining clients. Be proactive in finding customers for your trucking company, hiring an outside marketing firm, or doing it in house. 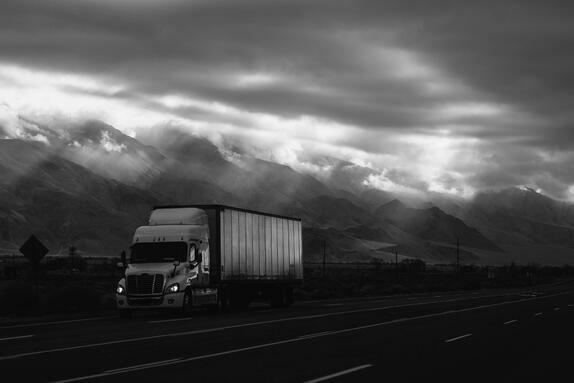 The trucking industry is demanding and competitive, and requires aggressive contract bidding for client accounts. Prioritize customer service to retain your clients in the future. Most of all, have fun at work and enjoy your new business!